As an additional cost to play Hatred, pay X life. He's definitely on the cusp, I spend life like it's mana, so it's comfortable having some lifegain. Definitely Baneslayer Angel is getting close to cut as well. We'll see what new A/D/D come with War. I found 22 A/D/D the buoyancy level, less than that, a high % of time you connect with a Kaalia of the Vast attack with nothing to play for free. 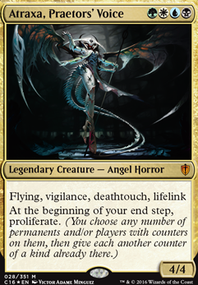 I could make good arguments for: Archangel Avacyn Flip shouldn't strike herself, Lord of the Void needs trample, Steel Hellkite . It's a balance, trying to get better consistency on Win-Con below turn 5, it's been a tough barrier to break though. weezel been a great help playtesting some of the cards, since I haven't had too much time lately outside my Budget commander league 2x a week to play. 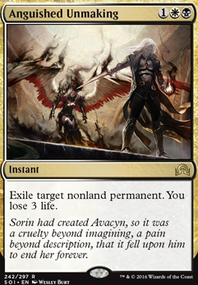 Damnation I need more indestructible (like Archangel Avacyn Flip), Teferi's Protection needs Split second or to be . I'm probably replacing Terminate with Gamble , and I've picked up a Hatred to try, but then I need MORE Lifelink. Hatred + Lifelink creature is Superstar, so he won't come out if Hatred is in. 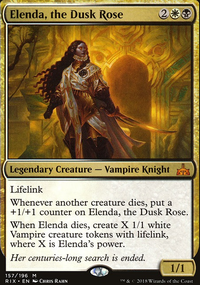 Assumed you were kidding LordKunai, poor Bruna, the Fading Light , if only they had given her an ETB! Might try an alternate combo piece instead of Reveillark like a Combat Celebrant but not sure. Hoping some cool new Dragons come out with Nicol Bolas, Dragon-God coming out. Reminds of the one I played. It was my 1st mono-black edh http://tappedout.net/mtg-decks/25-01-15-form-blazing-sword/. I say look at it and see some of the unblockable ways to get damage through. Dauthi Embrace gives ANY creature shadow. Hatred lets you end it in One Punch Man. Prowler's Helm , Trailblazer's Boots are another great way to get through. It's rare you go up against a Wall or a deck that has 0 non-basic lands in the deck. If you need more ramp you can always go the Extraplanar Lens + Snow-Covered Swamp route it is one of the cheapest to do the process for they are .50 each. It may take a while but its so worth it.Add Scrying Sheets for sweet top deck ramp. Terrain Generator Thawing Glaciers also serve as extra ramp in black. McToters on "It is Wednesday My Dudes"
+1 for title, meme-ness, and YARGle. My only suggestion is Hatred if you’re willing to get it. Absolute obliterator, and would be hilarious to catch opponents off guard! Dude, when I wrote my response, I was getting ready to pump some iron so I was loaded up on caffeine. My mind was going a kazillion miles per second and I completely forgot Kiki-Jiki, Mirror Breaker was in the deck Face palm That's why I was confused about Combat Celebrant and making remarks like "I hope you're ready to win" haha but now it all makes sense. I'm surprised I wrote what I wrote. How beneficial has Mausoleum Secrets been. Has it been consistent? Has it been hit or miss? Has there been times where its just been too late to use? pointless in a sense? 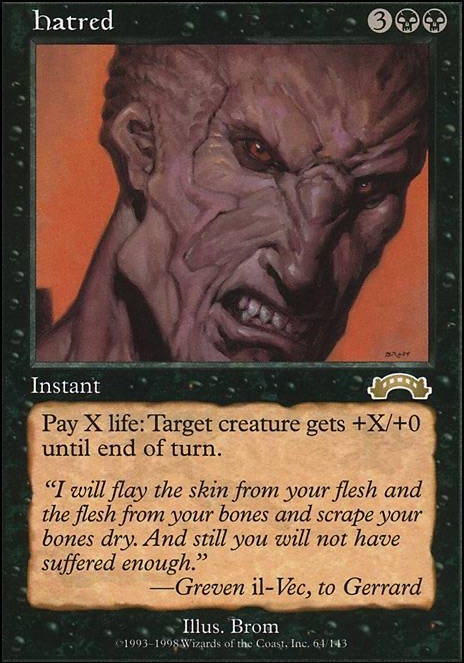 What card would you replace Faithless Looting for? I like the idea, its almost cycling in a sense. Getting rid of a card to draw 2 and to discard 2. Either, ones you been holding onto or don't have a need for at the time. You're almost reducing the deck count by that card. Its a nice move. I'm unsure about Entomb > Kiki-Jiki, Mirror Breaker + Mausoleum Secrets + Reanimate . Yes the outcome is nice but I feel the process is too timely. If you have None of those, are you really going to tutor for each one? I like the original Buried Alive > Kiki-Jiki, Mirror Breaker + Karmic Guide + Restoration Angel then BAM Reanimate . That just seems faster and quite simple. The other just seems more of a timely set up just to take advantage of a potential Combat Celebrant . I could be wrong and definitely be overlooking something here though. I very much so like the idea of using both Simian Spirit Guide and Dark Ritual . Simian Spirit Guide in a sense is reducing your deck count by 1 with the added bonus of a which also synergises with Mausoleum Secrets but then again, I also feel its one of those cards where it works perfect if you have it during the right time. As turns progress, is it really going to be beneficial or is it taking a slot of another more impactful card? I feel the same with Dark Ritual . What if Necropotence is already out way before you have Dark Ritual ? What slot is dark ritual taking away from? All great cards that work perfect at the right time. I'm probably over thinking it and making it more complicated then it needs to be. The play is get to your stuff quick. Discard stuff you aren't using to draw what you need to. Every card should be impactful, should all do something to benefit the game/next move. Whether its having you discard to draw, tutor or whatever it may be. 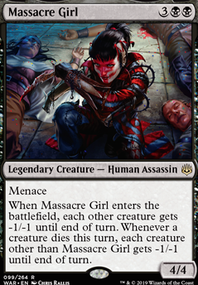 The last thing you want is to be stuck with a card where you're like "Ehh, I dont really need this anymore" or "now I cant use this" or "I wish I didnt have this in my hand" but that's why we play games, to test out cards to see if they make the cut or not. I do like Hatred though. I would lean towards that route first over Combat Celebrant and do some test runs that way. Just because its quicker and doesn't take the time to set up as Combat Celebrant would need. Then if you aren't liking it for whatever reason then try out Combat Celebrant I also like the benefit of Faithless Looting . I like the idea behind Dark Ritual and Simian Spirit Guide I just like the benefit of Simian Spirit Guide reducing the deck count without the cost of life or mana to actually add mana. I haven't played the deck yet, but you have. You know the gameplay more with your deck. so certain things might seem more plausible to you rather than me.